» Forum » Electro-Mechanical » EM Pinball Tech » William’s Grand Prix - One, three and four Player, but not two? » William’s Grand Prix - One, three and four Player, but not two? William’s Grand Prix - One, three and four Player, but not two? I've been slowly getting this machine up and running, but stumped on this particular issue. For 1, 3 or 4 players, the number of players indicator lights up for the respective number and advance the players correctly. Pressing the start button twice (which I would assume should be 2 players) causes none of those lights to be lit. Proceeding with a game in this mode appears to function as a 4 player game. From what I read, it sounded like this is a Coin Unit issue, so I cleaned the Coin Unit this evening but same results for a 2 player game. Anyone experienced this before? Could be a lose wire on the coin unit, the player reset does not work without a lead from it. That could explain the behaviour. 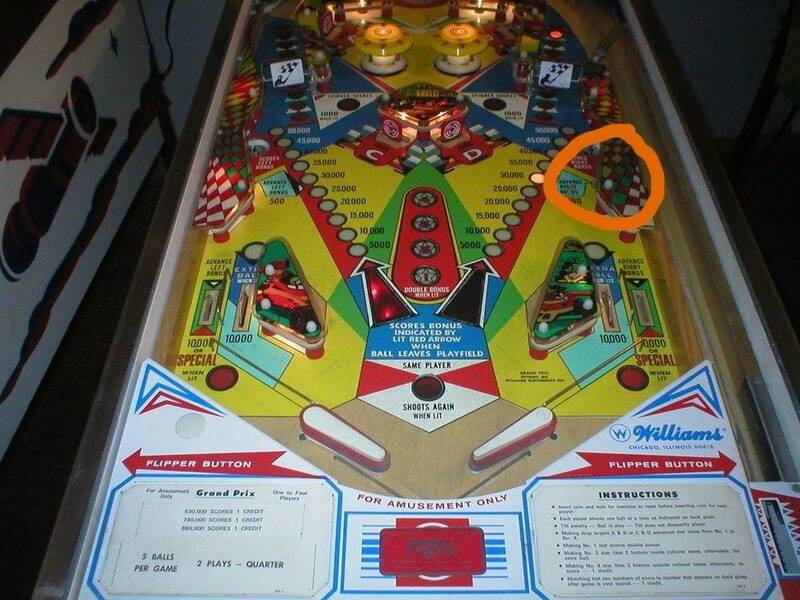 So: check the wires making contact on the two players on the coin unit. Hmm, will take a look and check back. Thanks! New game - hit credit button three times- all is well for a three player game and player 1 2 and 3 lights alternate as ball drains and all players get correct number of balls...is the true. New game- hit credit button 4 times- all is well- same thing as above with 4 players- all player lights work etc, game ends after ball 3 (or 5) for player 4. Is this true? But.....if you hit credit button twice you get a four player game- but no player lights are lit? Is this really what happens? Is it really 12 balls (4x3) or 20 (4x5) and then game over. That seems unlikely- Can you confirm above and provide more detail about what precisely is happening with the 1 3 or 4 player game and exactly what the 2 player game does? Count balls, watch player lights etc. I actually solved the problem this evening, but I can't say for sure what was the culprit. I was being less than intelligent with some alligator clip leads which killed all the backbox lights. I ended up cleaning a couple relays and some switches, but my hunch is it was my sanding/de-oxing of the flat, multi-wire backbox connections to the cabinet circuitry that got it working. I realized I had blown a fuse after all of the work (I'm assuming when the backbox lights went out). After swapping the fuse, the 2-Player Game light was working for the first time ever. Also, the chimes are now triggering for things they weren't triggering on before. This game is loud, almost feel bad for my neighbors playing after 9! For documentation sake, it was the 2-Player Game light that wasn't working (incremented by the Coin Unit Stepper) and in the case where it should have been lit, the game assumed it was in a 4-Player config (so 1,4,3 or 4 Players). The Player-Up lights were always working in every scenario. Thanks you both for your follow up on this! b. For a good working counters clean your counters, because they are a part of the loop in series with your relays. If a 500-point relay gets stuck most of the time it will be a problem with the counters. c. In the back there will be a Match unit. They are very fragile, and mostly are broken on the frame. If it is still working, you can manually operate them. If you have the machine in game over, you can test the lamps by turning the Match unit. C). If the game is in extra ball mode, match lights will not work. I replaced all the bulbs that were not working a few weeks ago, so I don't think that is the problem with the game over / match lights. The 500 relay still does get stuck in a loop after fixing the 2 Player problem. Going to clean up some of the bonus advancing steppers today to see if that helps. Thanks again! Well, I sanded and cleaned the left and right bonus advancing stepper rivets which fixed something that I didn't realize was a problem (now there is always chimes when advancing). Also, now the Game Over lights do light up at the end of a game. However, the main problem I was trying to solve still persists... the "500 point scoring loop". The loop occurs when hitting a particular switch on the right side of the table (see attached screenshot). Any other ideas what might be causing this issue? I am (Swiss) German speaking - what does "500 point scoring loop" means ? The ball hits the target and You get five times hundred points - BUT it does not stop You get another "five times 100 points" and again and again - but always 5 times 100 points ? You have marked in the picture "switch on the right" - question - when the ball hits on the left: Do You get the same fault ? Could be a too close contact on the score motor that releases the relay after the motorturn, or a nearly closed contact on the relay (closest to the relay, hold contact), or a bad spring on the relay. Top contact on the sixth set on the motor, the one just before the score cams (last two). rolf_martin_062, yes 100 points, appended five times with audible chime sound. I've never noticed the loop happen on the left side so that is interesting if its parallel as you say. Though, it could be we're just not hitting that side much. When I've tried to manually trigger the switch, I've never been able to cause a loop, so it doesn't seem like it's the switch, but rather some specific mid-game state that needs to happen before the switch ultimately triggers the loop. wizardblom the score motor looked intimidating so I haven't touched it much up to this point. Will take a look next time I open her up. I did a minor cleaning of the relay contacts, the scoring motor contacts and the chime box connector but no dice. Plan to look closer at the scoring motor soon. I want for the moment ONLY look at the 500-Relay problem. 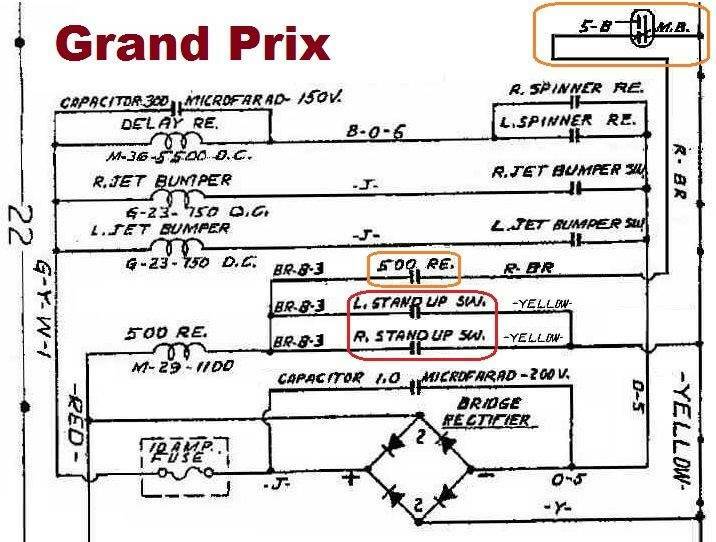 Here http://mirror2.ipdb.org/files/1072/Williams_1976_Grand_Prix_Manual.pdf on page-32 (ori-30) - the Switch-A on the 500-Relay. This is the (JPG, encircled orange) Self-Hold-Switch. Toggle-off the pin and inspect this switch - OPEN when the relay is not pulling ? A drop of solder fallen at the short stubs with wires soldered-on - a drop of solder - making faulty connection ? short stub bent making faulty contact ? Maybe the switch --- I believe in: ONE or both of the Playfield-Switches is faulty --- look for wire-color-brown-black / yellow. IF (if) You have mounted new rubbers: You may have bent the switch so it it always closed. Not only at the 500-relay-switch --- also on the playfield switches: Look for drop of solder / bent stub. P.S. : The Bridge Rectifier and the stuff connected to it: We do not need for the problem "500-Relay".